There is an issue that concerns most RVers that has bothered me for some time now. The issue is towing safety. RVers either tow a trailer behind a vehicle, or in many cases tow a vehicle behind a motorhome. Recently I reviewed five years worth of accident data involving vehicles towing trailers and the numbers I saw made me even more concerned. Granted, lots of these accidents involved smaller utility and cargo type trailers, but there are a lot of boat and RV towing accidents too. Let me ask you a question. Do you think individual state towing laws are outdated? If you tow a trailer or a vehicle behind a motorhome do you know what your state towing laws are? Each state is different when it come to towing laws, to include how much a trailer must weigh before it needs brakes. Even if you comply with the state towing laws where you reside you can be in violation of another state's towing laws where you might be traveling. When these topics come up and I comment on them some people have accused me of using scare tactics to make people think they need brakes on a trailer or vehicle they are towing, when the laws say they don't. One of my arguments has been that if your state laws require a trailer that weighs 3,000 pounds to have brakes why wouldn't a 3,000 pound vehicle being towed require brakes too. I'm not using scare tactics, I'm using good old common sense. Many of today's individual state towing laws haven't been looked at, changed or revised since the early 70's and some even longer than that. 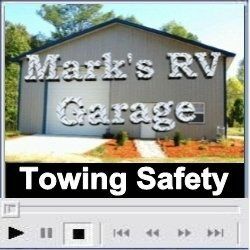 That's the topic for this week's feature article and this week's video tip at Mark's RV Garage. Be sure and check them both out in this edition of RV University this Week and let me know what your thoughts are. We are discounting both of our towing DVD titles this week in an effort to help inform and educate RVers on what is required to make all of your towing experiences safe and enjoyable. See the "specials" section towards the bottom of this page. Rubber roofs on RVs should be cleaned three to four times a year and depending on where you park or store your RV it may need to be cleaned more often. Regardless of the type of rubber roof you have, NEVER use any cleaners or conditioners that contain petroleum solvents, harsh abrasives, or citrus ingredients. These types of cleaners can cause permanent damage to any rubber or vinyl surface. Most manufacturers of rubber roofs recommend you use a medium bristle brush and a non-abrasive cleaner. For light cleaning you can use warm water and a mild detergent like Dawn dish washing liquid. Hard to clean areas like stubborn stains caused by leaves, sap, mold or mildew may require a second treatment. Use caution to prevent the cleaners from getting on the sides of the RV. ALWAYS rinse the sides, front and back of your RV before rinsing the roof to prevent streaking or damage to the finish on your RV. NOTE: Anytime you are working on the roof of your RV - excercise caution! A slip or fall could result in serious injury or even death. This RV video tip is: "Towing Safety"
Q. Maybe you can answer a question that I have always been curious about. Why is it that when you wire batteries in series only the voltage is doubled? Why, despite each battery having 205 amp hours, is the amp hours also not doubled? First you need very a basic understanding of how amps and volts differ. Amps are nothing more than the measure of the volume of electrical flow. Amps are not affected by voltage at all. Voltage is basically the force or the pressure that moves the electrical flow. Where 6-volts moves the electrical flow slowly, 12 or 24-volts moves the flow quicker. With that said series wiring is when you connect two or more of the same type batteries together by wiring from the positive terminal of the first battery to the negative terminal of the second battery. When batteries are wired from positive to negative the voltage of the individual battery's are added together. The reason for this is you only create a single path for the electrical flow (electrons) to follow. Series wiring does not affect (or increase) the actual storage capacity of the batteries only the voltage. In other words we are only adding electrical pressure (voltage) through series wiring not storage capacity. Parallel wiring on the other hand is when you connect two or more of the same type batteries together by wring positive to positive and negative to negative. The individual battery voltage stays the same, but wiring in this manner doubles the storage capacity (amp hours) of the individual battery's. By adding more batteries in parallel we create more paths for the electrical flow (electrons) to follow. This increases the total amperage or storage capacity but doesn't affect the voltage. But keep in mind even when you increase the storage capacity of the batteries you shouldn't discharge them below 40% (60% of the charge left) before charging if you want to maximize the life of the batteries.